Speciation - What is chromosomal evolution? Consider two forms of a chromosome, differing in an inversion. We can call the standard and inverted forms A and A' . Suppose that A and A' have identical sets of genes and produce the same phenotype, as in figure A. The two kinds of homozygote (AA and A'A' ) will have identical fitness. The heterozygote is likely to be selected against, because recombinants between the two forms may have double sets of some genes, and lack others. We have here a precondition for the evolution of assortative mating. AA types should preferentially mate with otherAA types and avoid crossing with A'A' ; and vice versa. A gene causing its bearer to mate assortatively with respect to chromosomal genotype will be favored. If assortative mating becomes established, speciation will result. Figure: in (a) a chromosomal inversion has a set of genes inverted. The letters represent genes along the chromosomes. 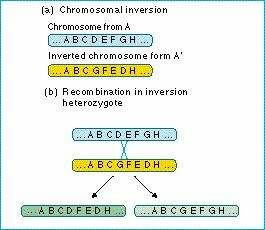 In (b) recombination in a heterozygote for a chromosomal inversion can produce chromosomes that lack some genes and have others in double dose. These forms are probably selected against.